SMTube 15.8.0 is now in the test repository. It's a standalone, Flash-free Youtube video browser, player, and downloader that will generally play the videos with less CPU usage and in higher quality than Flash or HTML 5 in the browser. You can choose basically any video player on your system to play the videos. Opening with Uget will download the video. For this build, I followed upstream Debian's lead and used Qt 5 instead of 4, because future. 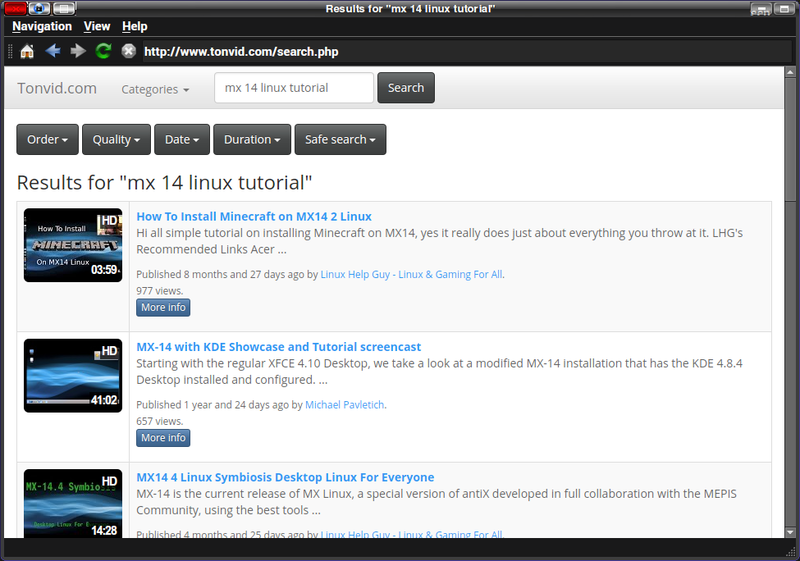 We'll want to include this as default with MX 15 and future snapshots of MX 14, so would appreciate any testing. Thanks! On the pre-alpha, it produces error for all videos of "It wasn't possible to find the URL of this video." Going to Help > Refresh YouTube code didn't help. Got VLC to work in MX 14 by editing its entry in settings and checking the box "This player supports video sites"--will test in the alpha. I think the mplayer2 in Jessie is too old, and we have to fix the mplayer in the MX 15 repo. If you set SMPlayer to use mpv as the binary (just uploaded a fresh 0.10 version of that), I believe it should work. Not that I can see. Set MP to use mpv, still get same error msg. It works with Jessie's stock smplayer-mplayer2 combo, so I'm going to guess my experimental qt5 build is to blame. Also our youtube-dl in the MX 15 repo is getting rather old. I'll try a qt4 rebuild to see what happens. The new Smtube doesn't work for me in MX-15 alpha either. And even in M12 the previous version works better than 15.80 which kept stopping/starting/buffering. I reverted just smtube and it works fine - even with the updated smplayer. I rebuilt smplayer against qt4, and it now works. I'll also rebuild smtube against qt4 to see if that helps. They seem to work better.